1 week of SPECTECULAR, sportive sailing in a STUNNING surrounding. 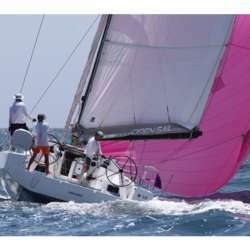 We have a Pogo 12.5 - a very fast crusing boat technically based on the class 40 racing boats. It has an extremely wide and flat hull, low weight, deep keel, carbon fibre mast and hughe sail area. Due to this is starts planning even in realtively light winds – something impossible to achieve with your standard crusiging boat. This type of sailing is completely different from what you will experience on “normal” crusing boats. Just as a rough comparison: Compared to a Bavaria of the same size, all the factors affecting sailing performance are approx. 30 to 40% better => weight, sailing area, draft, portion of total weight attributed to the keel (righting moment – allowing more sail area). Due to the width, the boat is also quite roomy and comfortable, though more basic and purpose built inside, than a normal crusing boat. We will be sailing from Olbia towards the stragith of Bonifacio. An area with a wide range of conditions for sailing (the straight of Bonifacio with more wind and waves due to the jet effect and hughe bays wich are more protected) and great harbours and bays (STUNNING Bonifacio and Lavezzi, La Madalena…) for the night. In that area we will do lot’s of Gennaker sailing with the target to reach at least 15 knots Protected content of boat speed . To reach this, we need to set the gennaker in approx. 20 to 25 kts of wind Protected content , which will require some practice. The variety of the sailing area, will allow us a lot of flexibility to pick the right conditions. This way, we can step by step increase the level of chalange we want (having said all that, safety will always come first). Expect approx Protected content (plus charter insurance and consumables) - with a 5 people crew (target). There would be one single cabin and two double cabins. All participants pay the same with some compensation payed by the person sleeping in the single cabin.